Charles Babbage was an astonishingly original and innovative thinker in Victorian Britain. Many innovations and important contributions are attributed to him including his idea for machines to perform mathematical calculations (his Calculating Engines) and the far more ambitious Analytical Engines which were flexible punch-card controlled general calculaters, he produced a Table of logarithms of the natural numbers from 1 to 108000 which was a standard reference from 1827 through the end of the century. Babbage pioneered many other technical innovations as well as developing mathematical code breaking. Babbage's Analytical Engine designs are particularly impressive today as they contained many similar elements to modern digital computers. For example, Babbage's engines 'punched card control; separate store and mill; a set of internal registers (the table axes); fast multiplier/divider; a range of peripherals; even array processing' (Hyman). The Science Museum assembled Babbage's Calculating Engine number 2 according to his original designs in 1991. To witness the whirl and thudding stamp of this machine is a thrilling experience. But I would here call attention to a remarkable illustration of natural law which has been brought forward by Mr. Babbage, in his Ninth Bridgewater Treatise. The reader is requested to suppose himself seated before the calculating machine, and observing it. It is moved by a weight, and there is a wheel which revolves through a small angle round its axis, at short intervals, presenting to his eye successively, a series of numbers engraved on its divided circumference. Let the figures thus seen be the series, 1, 2, 3, 4, 5, &c., of natural numbers, each of which exceeds its immediate antecedent by unity. "Now, reader," says Mr. Babbage, " let me ask you how long you will have counted before you are firmly convinced that the engine has been so adjusted, that it will continue, while its motion is maintained, to produce the same series of natural numbers? Some minds are so constituted, that, after passing the first hundred terms, they will be satisfied that they are acquainted with the law. After seeing five hundred terms few will doubt, and after the fifty thousandth term the propensity to believe that the succeeding term will be fifty thousand and one, will be almost irresistible. That term will be fifty thousand and one; and the same regular succession will continue; the five millionth and the fifty millionth term will still appear in their expected order, and one unbroken chain of natural numbers will pass before your eyes, from one up to one hundred million. being, in fact, the series of triangular numbers,* each multiplied by 10,000.
" If we now continue to observe the numbers presented by the wheel, we shall find, that for a hundred, or even for a thousand terms, they continue to follow the new law relating to the tri- angular numbers; but after watching them for 2761 terms, we find that this law fails in the case of the 2762d term.
" If we continue to observe, we shall discover another law then coming into action, which also is dependent, but in a different manner, on triangular numbers. This will continue through about 1430 terms, when a new law is again introduced which extends over about 950 terms, and this, too, like all its predecessors, fails, and gives place to other laws, which appear at different intervals. 100,010,002 at the 100,000,002nd term was as necessary a consequence of the original adjustment, and might have been as fully foreknown at the commencement, as was the regular succession of any one of the intermediate numbers to its immediate antecedent. The same remark applies to the next apparent deviation from the new law, which was founded on an induction of 2761 terms, and also to the succeeding law, with this limitation only- that, whilst their consecutive introduction at various definite intervals, is a necessary consequence of the mechanical structure of the engine, our knowledge of analysis does not enable us to predict the periods themselves at which the more distant laws will be introduced." Babbage. The Ninth Bridgewater Treatise (1837). Babbage. The Economy of Machinery and Manufactures (1832). Gibson, William, and Bruce Sterling. The Difference Engine. New York: Bantam Spectra, 1991. Menabrea, Luigi Federico. Sketch of the Analytical Engine Invented by Charles Babbage, Esq., Orig published in French in 1842 in Bibliothèque Universelle de Genève, No. 82. Trans published in 1843 in the Scientific Memoirs, 3, 666-. Trans by Ada Lovelace. Babbage's Intelligence: Calculating Engines and the Factory System, by Simon Schaffer. The Babbage pages by R.A. Hyman. 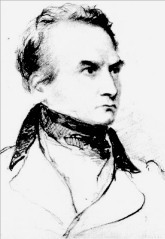 Charles Babbage pages by C.J.D. Roberts- includes a wealth of primary sources. Swade, Doron. Charles Babbage and his Calculating Engines. London: Science Museum, 1991. The Analytical engine by Jon Walker (includes primary texts). Hyman, Charles Babbage, Pioneer of the Computer. 1982. A standard biography of Babbage.